Curating a museum of imaginary things could be an interesting challenge. What, of all that the human imagination can call forth, would be included? For Deirdre Loughridge and Thomas Patteson, the answer was a museum of imaginary instruments. The co-curators’ collection is not all light-hearted fantasy. 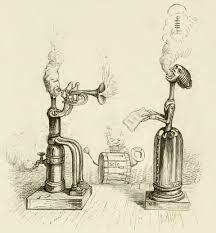 The Museum of Imaginary Musical Instruments is a serious examination of conceptualized-but-not-realized instruments across history, from steam-powered mechanical singers to the infamous cat piano. The Museum of Imaginary Instruments is divided into exhibits, for example the enormous instruments of Gigantism or extraordinary keyboards in Keyboard Interfaces. Take a look and see what strikes your fancy. For a bit more elaborate introduction and more examples, you might want to read the description in The Public Domain Review. 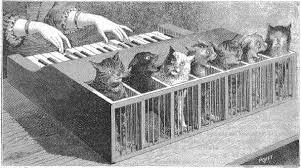 Like the cat piano, some of the instruments imagined in literature and art have been cruel, so giving younger students unfettered access to the site would be inappropriate. But a sampling of examples from across the collection could be a fine addition to a unit on sound. Imagine having students analyze a selection of instruments. They could determine how sound would be produced, how pitch or volume might be altered, and whether they believe the instrument would actually play. Perhaps they could design their own imaginary instruments, with an explanation of the principles behind the design. Their designs could make a fine bulletin board display—either old school or virtual—or an interesting addition to your class blog or website. Needless to say, we’d love to see it, too, so if you explore, please share. Just for fun, you might enjoy this modern version of an imaginary instrument. At least I assume it’s imaginary. What do you think? ?